The Animal Care & Adoption Center has shaded outside areas all thanks to boy scout Jake Rasmussen and Pam Wagner. 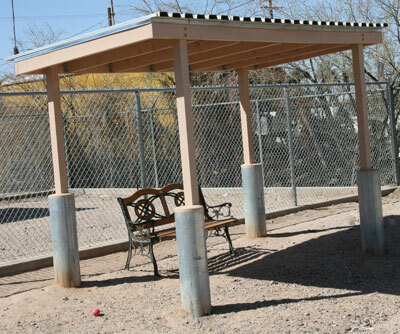 Rasmussen’s Eagle Scout project built two shaded areas in the walkabout areas affectionately called, A Place to Paws. It is a project he volunteered to do because of his love for our critters waiting for new homes. The materials were kindly donated by Pam Wagner. A Place to Paws is a secluded area that gives people and pets an opportunity to sit and visit as part of the adoption process. The Animal Care & Adoption Center is always in need of volunteers. For more information, call (520) 426-9300. Please leave a message, we will call you back. Donations are welcome.